By now you’ve probably heard about Slack, the wildly successful communication app that’s replacing email in just about every company from AirBnB to AutoDesk. The Slack boom is part of the trend of replacing email with in-app communication, whenever possible. It is the business equivalent of texting, and–let’s face it–even your parents prefer texting to email these days. That in-app trend has extended to how companies gather customer feedback, including Net Promoter Score. (What company doesn’t need a high level, data-focused view of how the customer base rates their offering, plus detailed comments on why those numbers were given? That’s exactly what NPS provides.) Platforms like Wootric that deliver the Net Promoter Score survey inside web and mobile apps garner high survey response rates (25% – 60%) — another reflection of the customer’s preference for in-app interactions over email. 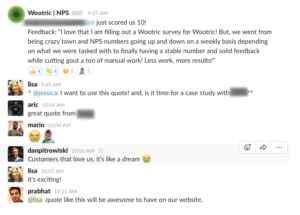 Now, with Wootric’s integration, gathering Net Promoter Score data and sending it into Slack channel couldn’t be easier — and the benefits are compelling. UPDATES: You can send CSAT and CES (Customer EFfort Score) survey responses into Slack, not just NPS. You can also send customer properties with the response. More good news: Slack offers a free account and so does Wootric. Getting started won’t cost you a dime! In this post we will show you how and why to integrate Wootric with Slack, an application that naturally unifies teams. The two together make a powerful combo to convert your NPS data into real-time conversations, and take actions that can rescue customer relationships, and turn others into brand advocates. This is best for a small company or team, and it is how we use our own integration. At Wootric, we are extremely customer-focused. Every response is meaningful to our entire team which is still small, relatively speaking. The result in this case was twofold. Our team was once again “knit together” around customer happiness, and I got a great quote to share with potential customers. Of course, our customers raise issues via NPS too, and having that in Slack is just as valuable. Rather than customer success going to engineering and explaining a situation, the entire team can glance at the Slack channel and see the comment straight from the customer’s mouth. The relevant stakeholders then pull together and figure out a solution asap. General feedback and feature requests directly influence our product roadmap. Send promoter responses to Sales so they can follow-up for referrals and upsells, and to Marketing since they can make the most of comments from promoters by turning them into testimonials. Send detractor comments to Customer Support/Success so they can close the loop with customers that are disgruntled. Your particular needs may vary depending on who is responsible for what in your company. The Slack integration can be customized with a few clicks in the Wootric dashboard. Not only does our team use and love Slack, but we discovered that the Slack team can’t live without NPS. According to Slack CMO Bill Macaitis, NPS helps “every single person at the company influence the perception and experience the brand delivers.” Bill believes that it’s not enough to satisfy customers. Your goal should be to identify the people that really love the product and turn them into evangelists. Want more out of your NPS program? Get the ebook, The Modern Guide to Winning Customers with Net Promoter Score. Leverage customer feedback and drive growth with a real-time approach. Let’s be honest, information from the front lines does not always travel clearly up the ladder. People at the top need to know details about the customer experience, and NPS helps with that. Bill says that every CEO should be able to answer this question: “What are the top 3 reasons why people recommend and do not recommend your brand?” When NPS feedback is shared in real-time via Slack, company leaders will not be the last to know and can keep a pulse on the most important customer issues. NPS data in Slack keeps you honest. Saastr’s Jason Lemkin says this is the top reason why he loves NPS. Sharing NPS data via Slack in real-time demonstrates transparency. It means more team members are staying close to the customer– and keeping it real. Collaboration happens organically. There is an interesting psychological component to communication that makes Slack uniquely suited to facilitate action. When we receive a detailed email, we may not respond right away. (How many of us star it for follow up later?) When we are @mentioned in slack, there is a natural conversational flow. Stakeholders can be brought in and agreement reached for next steps. Close the loop with customers in real-time–and eliminate redundancies. At one of our customer companies, team members tag responses they will personally follow-up with by adding an emoji to the response. This company is surveying logged-in customers (as opposed to website visitors), so the customer’s email address appears in the Slack channel along with the survey result. With one click, that team member that indicates “I got this one!” can reach out to the customer to thank them for their response and follow-up for more info. Add stars to anything you need to reply to or take action on. Slack is helping to replace email, which is designed to create a record of all communication. But when you communicate in chat rooms, things can sometimes get lost. Action items and mere information can also easily become co-mingled. Click the star button in the top right corner of your Slack window to view all of your starred messages ordered by time. Although it’s easy to star messages to save them for later, it’s not particularly obvious that specific direct message and channel streams can be starred. With this handy tool, you can place them in a favorites-style list at the top of the sidebar. Create new channels. The more organized you are in Slack, the more efficiently you can use it. Break initiatives down by specific need or by customer. For example, direct promoter feedback to an Advocacy Marketing channel. You can then discuss ideas for software and content to optimize your customer referral campaigns. Integrate with Trello to collaborate on tasks. Why stop at just one integration? Slack integrates with Trello so you can easily shift from agreeing on how to move forward with an issue, to taking the steps to get it done. Create meeting invites & share documents. The most common action items following a customer discussion in Slack are setting meeting and creating assets. So is it any surprise that Slack integrates with Google Calendar and Drive? Did you just receive feedback from several detractors about a specific feature? Schedule a meeting to discuss updates to the product roadmap. Did you just receive stellar feedback from a promoter? 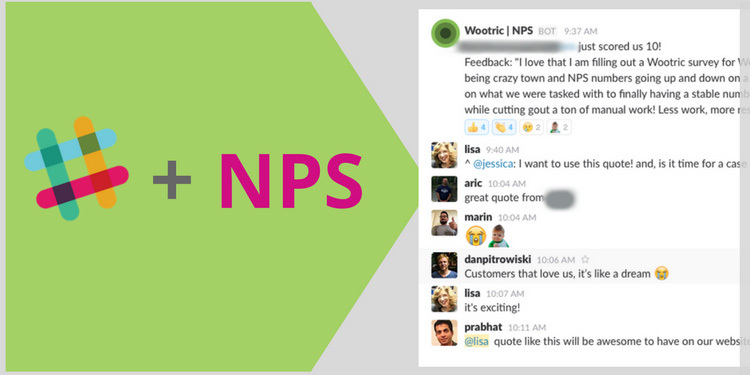 Drop those NPS comments into a shared “Testimonials” document. According to Venture Capitalist and co-founder of Point Nine Capital, Christoph Janz, the future of SaaS lies in the hands of API integrations between complementary best-in-class applications. Set up rules to send feedback to specific channels, like all feedback to your #product channel, or testimonials from promoters to your #marketing channel. Filter the types of responses that you want to send and from whom. For example, you can share only responses with qualitative feedback. Filter whether that information comes from promoters, passives, detractors or from everyone. A customer-focused culture always begins with awareness around how your customers feel about you. How you obtain that information, broadcast it, and convert it to action, now necessarily depends on software. Integrate your NPS feedback and data with Slack. It could mean the difference between a failing company that sporadically responds to its customers, or a successful one that is passionate about customer happiness.